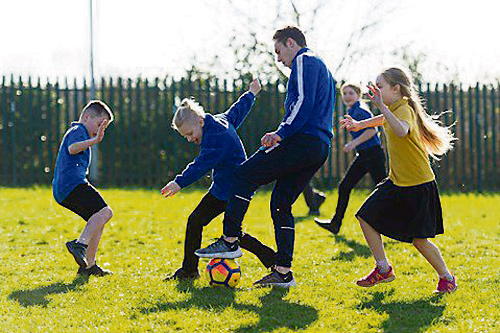 YOUNGSTERS at Barley Close Primary School enjoyed a kick-about with a Bristol Rovers player who came to visit them. Midfielder Sam Matthews came to the school to donate free tickets for the club’s Checkatrade Trophy semi-final against Sunderland. After handing out 30 sets of tickets, Sam fielded questions from pupils on a variety of football-related topics before heading out for a kick about. Although Rovers didn't make it through to the final in the end, the visit from Sam went down well at Barley Close. Sam said: "The children seemed excited and looked like they enjoyed it. "There were a few funny questions from the pupils, asking about the rivalry with our City neighbours! “Hopefully they enjoyed the opportunity to come down and watch the game against Sunderland."